Forgot to take a picture. Here’s one from http://www.restaurantwidow.com instead. I’m into risotto. It’s one of those dishes that makes you feel really accomplished for taking the time to cook, but is actually really easy. Once you learn the basic ratio (1 cup arborio rice to 4 cups chicken broth) and recipe (brown the onion and garlic, toast rice, slowly add liquid), you can take it any direction you want. I made this last weekend, it’s reminiscent of pappa al pomodoro and great for a fall day. If you want to make it extra decadent, you can add the butter and cream at the end, but you don’t need them for this to be rich and filling. Heat the chicken broth in a separate pot until warm. Brown the onion and garlic in a few tablespoons of olive oil over medium heat. Add the rice and stir to mix everything over medium heat. Add the wine and stir until absorbed by the rice. Add the broth by 1/2 cup increments until it is absorbed into the rice. After two cups, add the herbs and the lemon juice and zest. Once you have added 6 cups of broth, add the tomatoes. Depending on the consistency at this point, you may not need to add anymore broth. 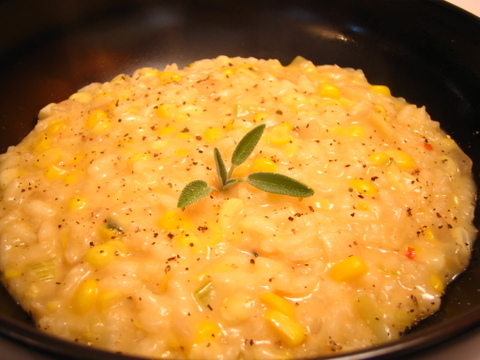 You want the risotto to relax on the plate- it shouldn’t be soupy it shouldn’t be solid either. At this point you can add the optional butter and cream if you want to make the dish more decadent, but this also makes it extra rich. Salt to taste. Top with parmesan cheese. Serve immediately.